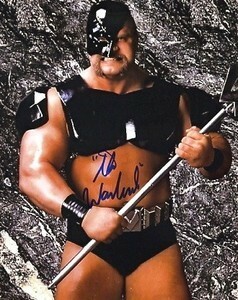 Powers of Pain were a unsuccessful knock off version of The Road Warriors brought in to compete with a successful knock off version of the Road Warriors, Demolition. Originally they were faces and fans showed their appreciation by not giving a damn. They were rough and ready and boring. 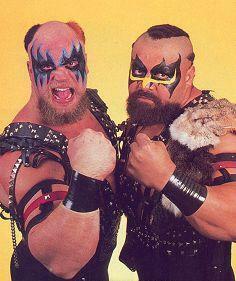 WWF realized this in Survivor Series 1988 and switch Demolition to face and these guys to heel. Wrestlemania 1989 featured The Powers of Pain losing in a 3 against 2 match handicapped match where they had the advantage Huzzah. Thats it.
. Both Barbarian and Warlord would have brief singles careers where they would be big looking and lose to similar shaped big looking good guys. Warlord even got the record for quickest elimination in the Royal Rumble at 2 seconds. That record was only recently broken by Santino Marella, a comedy character. Proof in the pudding that these guys don’t belong. WWE Hall of Fame has been selective in its tag teams over any area. They induct tag teams who are worth it. This one is not. 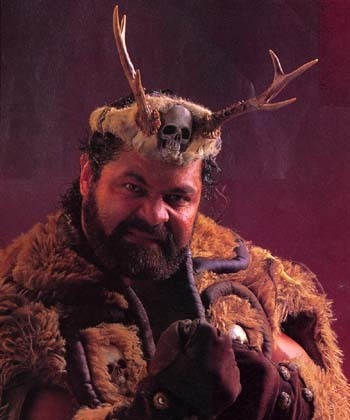 Barbarian’s new gimmick was a Samoan Viking Barbarian. Well known historical fact, that is not real. Meanwhile Warlord embraced the Phantom of the Opera and septors. Pointy septors! Success! Or strong guys who lose all the time. You decide. Take a look at the Powers of Pain lose at Wrestlemania!